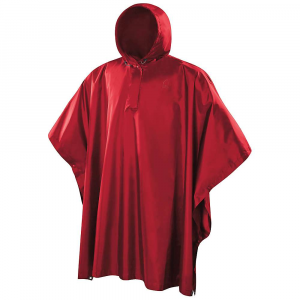 Visit Sierra Designs's Men's	Storm Poncho page. The versatile, trusted poncho of every backpacker's childhood, but perfected with the latest materials and few smart twists. With fully taped PVC-free seams and an adjustable hood, stay dry and comfortable in the rain, whether you're camping or at a football game. Washing/Care Instructions: Hand wash or use front-load washer only (no agitator). Use synthetic fabric soaps found at outdoor specialty locations. Do not use fabric softeners or bleach. Hang dry away from heat. Do not iron. 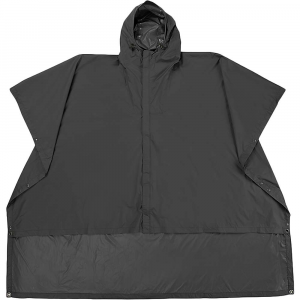 Rain protection doesn't get much easier than the Sierra Designs Storm Poncho. Whether your travels take you to town or the trailhead, this rain poncho translates to easy slip-on storm protection from the elements. Using Sierra Designs' waterproof polyester Storm fabric, you get hooded weatherproof protection with easy over-the-top deployment. Thanks to its generous cut and poncho style, you can throw it on over your regular clothes, backpack and all. The Poncho's long cut protects your upper legs, too. Generous arm holes allow for a great range of motion, while the hood maximizes your protection. The Velcro placket helps ease transitions and adds venting, while side snaps help to accommodate backpacks and make the poncho easy to put on and remove. The whole thing packs into its own zippered storage bag for easy travelling. A little rain protection goes a long way whether you're traveling or hiking, and the Sierra Designs Storm Poncho for men and women puts full rain coverage in a lightweight, easy to wear package.